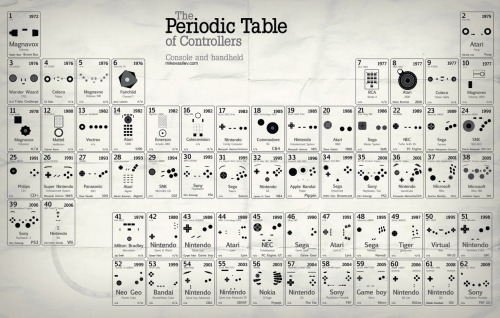 We Love Datavis posted this Periodic Table of Controllers by Mike Vasilev. It’s interesting and clever, and suffers from the same problem that plagues all periodic tables of not-elements: the contents of the table aren’t periodic, rendering the periodic format irrelevant. In this case we’re looking at a chronological list, that happens to be laid out in the shape of the periodic table. This is unfortunate for two reasons. The first is it propagates pointless use of the periodic table format. The second is this data could have been represented in a much more interesting and useful way, that more closely matched the native structure of the data and that revealed that structure in an accessible way. It would have made a fascinating study of the evolution of the controller form factor. Imagine a great family tree, showing the generational changes of the main branches of Nintendo, Sony, etc., with origins and cross influences indicated, innovations highlighted, and the dead-ends clearly represented. Instead we get a format that avoids revealing the interesting relationships that exist. I’d love to see it redrawn by someone who knows the game controller lineage. Any volunteers? Unfortunately, you can’t click anywhere below to get to the categories explained there, and instead must find the category in the pulldown menu above. Terrible.